There is quite a lot to do, and we give some ideas on this page. We invite you to visit us. The best times are most Tuesday afternoons, Friday and Saturday in the spring and summer months and of course Sunday for a service. We also normally have open days on bank Holidays, except for Christmas and New Year. We aim to make access to and enjoyment of the church easy for everyone. Please see our page on Accessibility. Should you need any further help or advice please do contact us. St Luke's is blessed with its location. It is often referred to as "The church in the pinewoods" but that is only part of the story. A walk from the church goes through the pinewoods to open heath land, then sand dunes and finally the beach. On the way some quite rare creatures may be seen - red squirrels and, if you are very lucky, natterjack toads. The picture above shows pine trees in the distance viewed from near the sand hills. The Sefton Costal Footpath extends for 21 miles, 34 km from Crosby in the south to Crossens, just north of Southport, but there is no need to walk all of the path. The route goes through the Ainsdale National Nature Reserve, and passes a short distance to the west of St. Luke's. If you are walking the route on a Friday or Saturday in spring or summer why not stop off at our tea room? Two miles north of St Luke's is the National Trust's Formby nature reserve. There are short marked walks through pinewoods that are home to red squirrels, and car parks close to the beach. The area gets very busy at weekends and in school holidays when the weather is favourable. A few miles south of St Luke's is Antony Gormley's Another Place. This consists of 100 life size statues on the beech at Crosby. 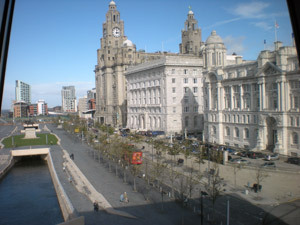 The statues are made from cast iron and look out over the estuary of the Mersey. At high tide most of the statues are submerged, so please check the tide times if you want to see them. Some ten miles north is the all-year-round resort town of Southport. Quite low cost park-and-ride is signposted or travel by bus or train from Formby. Southport is well known for its shopping areas, especially Lord Street, gardens and leisure lakes. There is an annual flower show and other events like an air display, firework competition and concerts in the park. There are many more things to do in the area, so we hope we have given you a few ideas. One final thought though, St Luke's church itself is a Grade 2 Listed building and is worthy of a visit.